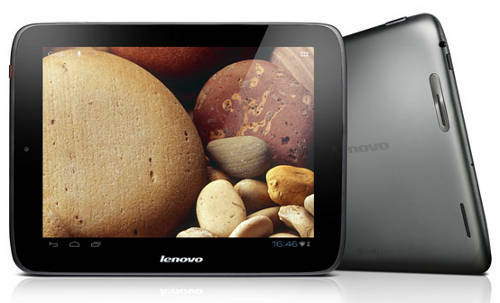 Lenovo has just released a new tablet called the IdeaTab S2109. It’s kind of like an iPad 2 but with an Android twist. Like the iPad 2, the new Lenovo IdeaTab has 9.7″ IPS display with a resolution of 1024 x 768. Other similar features include the same weight (1.3 pounds) and thickness (0.35″), Bluetooth, Wi-Fi, a 1.3MP front-facing camera, and 10 hour battery life. The IdeaTab S2109 also sports a microSD card slot and mini-HDMI port. It runs Android 4.0 and runs a dual-core Cortex A9 processor with 1GB of RAM. There are three memory options: 8GB, 16GB, and 32GB. The pricing for each is as follows: $329, $349, and $399. They are available from Lenovo’s website as well as from Office Depot. The most interesting feature with new IdeaTab is it has four speakers on the back instead of the usual one or two with other tablets. Lenovo is emphasizing richer sound and better base. When it comes right down to it, though, the IdeaTab S2109 doesn’t have anything that makes it stand out. This year a lot of Android tablet makers have decided to cut back the price to be cheaper than the iPad, but the downside with that is the specs aren’t anything spectacular. At $329 for the 8GB model, that’s a good price for a tablet like this, but once it starts edging beyond that there are better options out there. The 32GB Asus Transformer TF300, for instance, costs $399 and has a faster quad-core processor, a rear camera, and of course the optional keyboard dock. But if you favor the 4:3 ratio screen, which isn’t as common with Android tablets, then the IdeaTab S2109 may be worth a look.